Sanding has gotten a bad rap in the last several years as chalk paint has come on the scene. 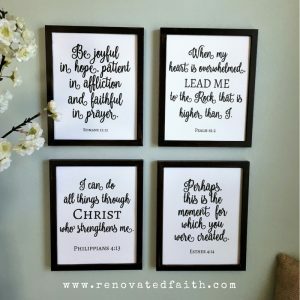 What many don’t realize is that the vast majority of furniture pieces need to be sanded, even ones that are chalk painted (see my post Why I Don’t Use Chalk Paint). 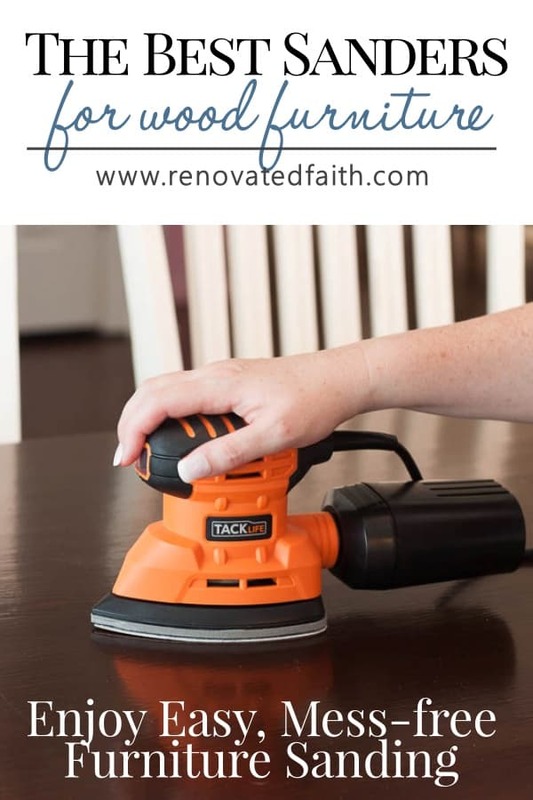 Whether you use chalk paint, latex or any specialty furniture paint, there’s a good chance you will have to sand your furniture piece and an electric hand sander makes it so much easier than sanding by hand! Here I’ll show you the best sanders for wood furniture! The purpose of sanding is to rough up the old surface of paint so that the new paint sticks. 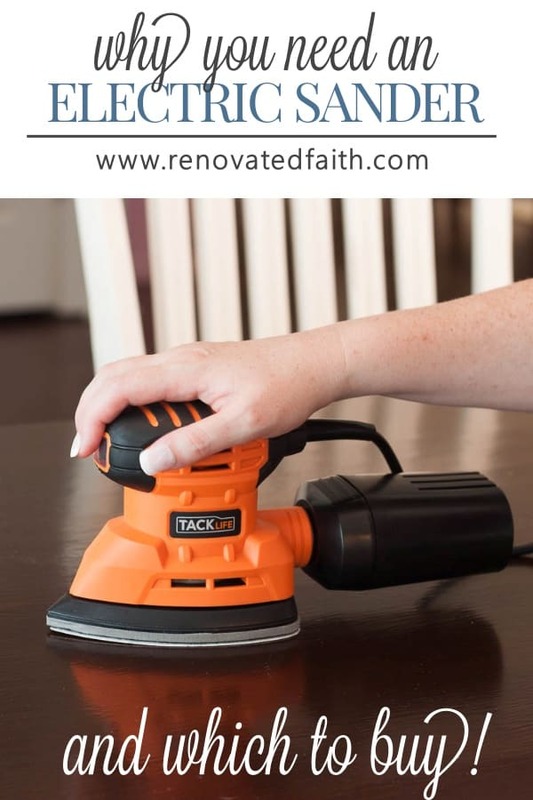 A hand sander (sometimes called a mouse sander or palm sander) makes the process quick and painless and it the best sander for furniture restoration. When I bought my first sander, I was absolutely shocked at how easy it was to use. It took WAY less effort than sanding by hand and the dust catcher collected most of the sanding dust. Click here for the 6 top sanders for furniture refinishing. Some things to consider when buying a sander is how it feels in your hand. Is the tip and bottom plate surrounded by plastic or is it metal? Does it have a removable tip and is that tip likely to break? Does it have the detachable Velcro for easy removal of sanding pads? Does it use generic size sanding pads? Does it have a dust catcher and how effective is it? I took all these things into consideration as I review these 6 sanders below to determine the best sanders for wood. 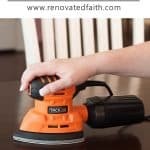 ✅This specific electric sander is our top pick and an Amazon Best Seller. ✅ Compare the reviews of the 6 sanders below by going to this link here. The cost of this sander is pretty amazing but don’t let it fool you into thinking this detail sander from Genesis won’t get the job done. I’ve used this same sander on dozens of projects including the rolltop desk, blue writing desk and Morgan’s laminate secretary desk. The design feels stable in my hand and gives me good control. It is also small and light-weight. This is a great first-time sander especially if you are getting over intimidation of power tools as I was when I bought it. I realized how much easier sanding was and this simple sander made sanding go faster than I expected, making it one of the best sanders for wood furniture. It’s small but any standard mouse sanding pad will fit this sander. It weighs just over 2 lbs and has a speed of 14,000 RPM. It even boasts a 2 year warranty if the low price makes you question it’s quality. It is definitely the best small sander for crafts. Check the current price and read reviews HERE. This sander offers pressure control which helps maintain a more even finish. It even includes 8 detail sanding attachments to access tough-to-reach corners making it the best small detail sander. Unlike the last sander, the SKIL Octo has a clear view dust cannister which allows you to see how much dust has been collected, removing the guesswork for when to empty the container. The microfiltration helps to capture smaller dust particles you might now normally catch. The price and size make this a good sander but some reviews complained about the functionality of the attachments. However, it’s versatility, ergonomic design and filtration system make this sander a great tool for the price. Check the current price and read reviews HERE. The WEN 6301 allows for easy sanding to get a very smooth finish on your latest DIY project. The one amp motor ensures even sanding while the suction adaptor allows for attachment to your vacuum cleaner. Like other sanders, it has a hook and loop base for each attachment of sand paper pads. Reviewers say this sander is sturdy and well-built even considering the price. They also state that it comes with a dust collection bag if you don’t want to attach the sander to your vacuum cleaner. A few reviewers state that the the tip of the sander is somewhat delicate so one should be careful to always keep it level. Check the current price and read reviews HERE. This mouse sander has a compact size and ergonomic stability for easy sanding but also offers some other important features. With a high-performance micro-filtration dust collection system, you don’t have to attach it to your vacuum. The Black+Decker BDEMS600 has as convenient 3-positional tip for versatility depending on the furniture project you are sanding. It has a detail finger attachment for getting in small spaces but some reviewers said this attachment broke off after several uses. This sander is unique in that it has a trigger switch instead of a toggle switch. Check the current price and read reviews HERE. The BDCMS20 gives you the same convenience as the last model but without the cord. It also has an ergonomic design that gets in tight corners. The detail finger attachment can be easily interchanged to make sanding smaller spaces even easier. One complaint was that it was somewhat heavy but that is going to be the case with any cordless mouse sander. 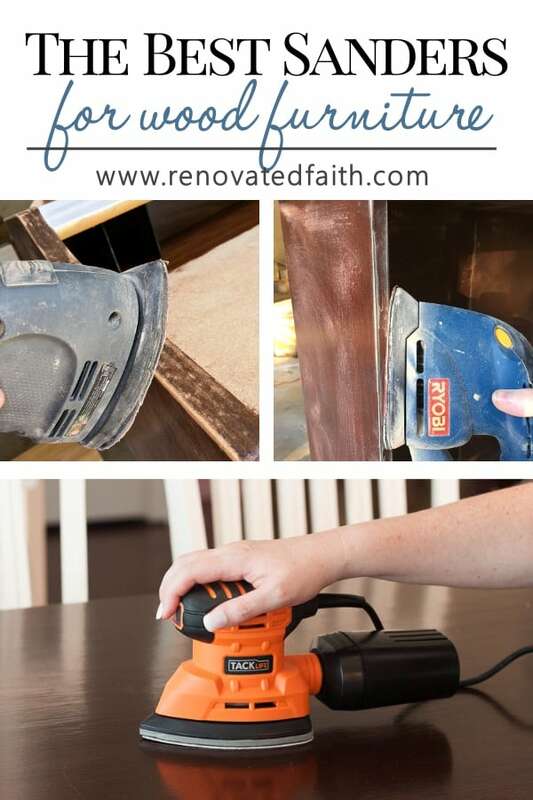 However, for that reason it is probably the best sander for sanding stained wood to restain because the extra weight will work in your favor. It comes with a battery, charger and dust collector for easy clean-up. It has plenty of power and long battery life for your furniture project. One reviewer remarked that she used for all of her kitchen cabinets while only having to stop and recharge once. I found that pretty amazing considering the scope of that project. It has a dust-sealed switch and a 12,000 orbit per minute motor. Check the current price and read reviews HERE. This sander has an ergonomic design much like it’s contemporaries but the top allows you to get a better, more even grip than others. 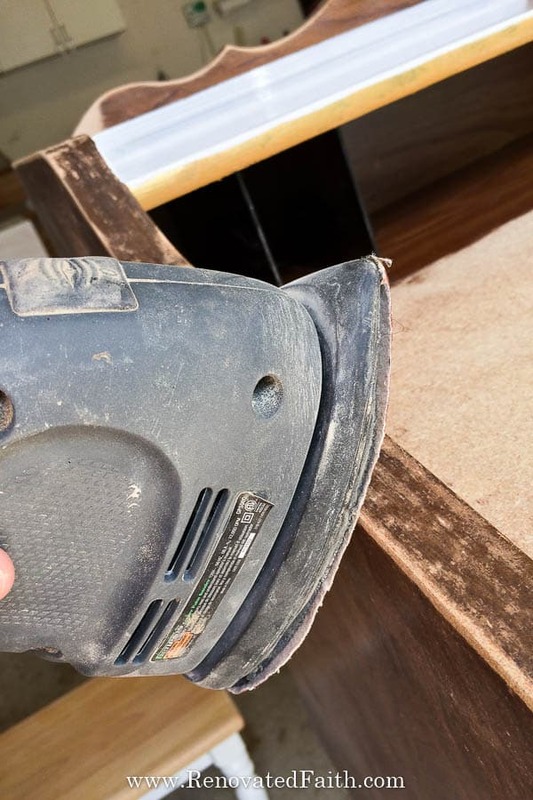 The main feature of this sander is it’s high-performance dust collection which traps the vast majority of dust, even allowing you to sand indoors. The sander runs at 12,000 RPM with 1.1 amps of power. It even comes with an assortment of sandpaper pads. This palm sander also has an adaptor to a vacuum hose in addition to the filter bag. This is a very flexible and compact sander that allows comfortable sanding of furniture pieces with very little mess. One review stated that the dust bin comes off at times but I’ve found if I put it on and rotate it slightly to tighten it, I have no problem with this. Check the current price here. 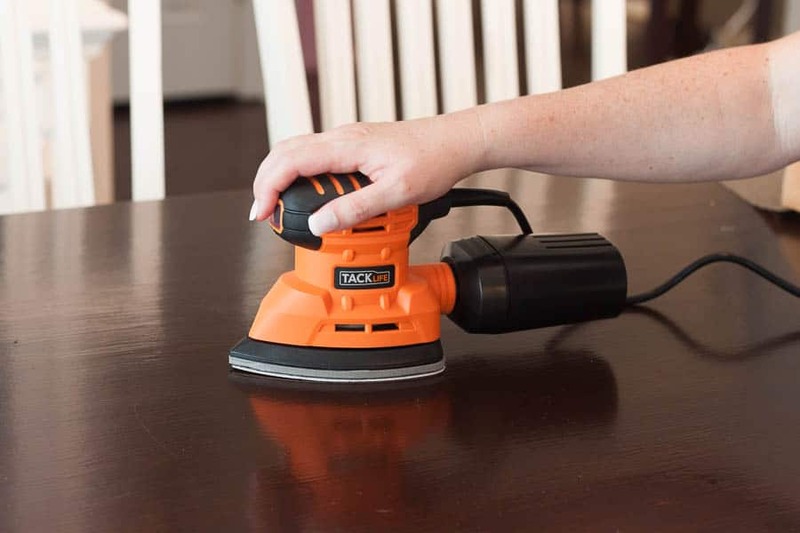 The TACKLIFE MOUSE SANDER (PMS01A) has more than enough features to sand and refinish even the most detailed furniture projects. The grip placement allows for comfortable and even sanding of furniture surfaces because of the weight distribution. This palm sander, although powerful is also very light and you can’t beat the price making it the best sander for furniture refinishing. Unlike some of the hand sanders in it’s class, it does not offer a removable tip for detail areas but I find this is a plus because these tips often times break off easily. Also, the standard tip is angled enough to get into small spaces on it’s own. I would also say this is the best sander for doors or any other project you might want to tackle indoors. There will still be some dust but not a lot. See more pictures HERE. I love the dust collection unit and while there is still some dust, the TACKLIFE PMS01A removes and collects the vast majority of it. Conveniently this sander comes with quality sanding pads in two different grits. You can check reviews and see the current price for this sander here. Also, you’ll notice it comes with a vacuum cleaner adapter for attachment to any vacuum cleaner. 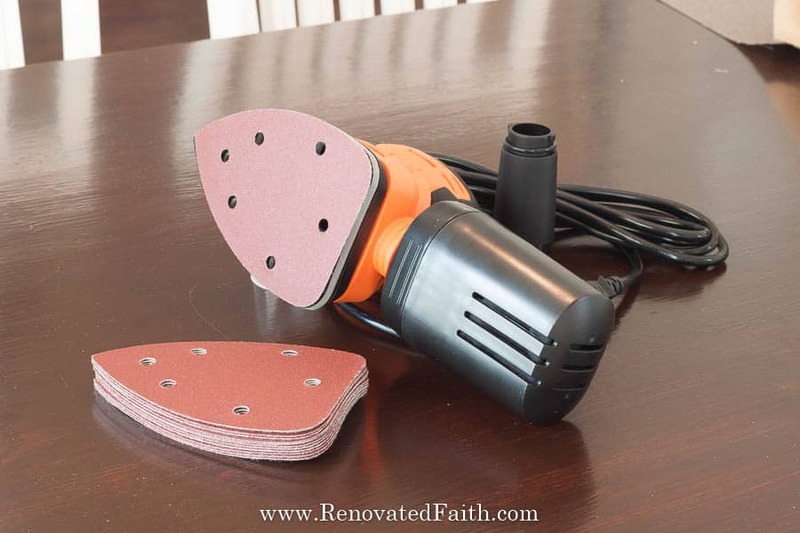 A close second was the Genesis Sander and if you just want to get your feet wet and aren’t concerned about a dust collection unit, this sander is for you. Both offer plenty of power and versatility for your next DIY project. I have this sander and used it on dozens of projects before opting for something a little more heavy duty with a dust collector. This is an Amazon’s Choice item so it goes on sale often. If you get it under $15, then that’s a great deal. Check the current price here. BEST PRICED SANDER – GENESIS GPS080 – Check the current price HERE. 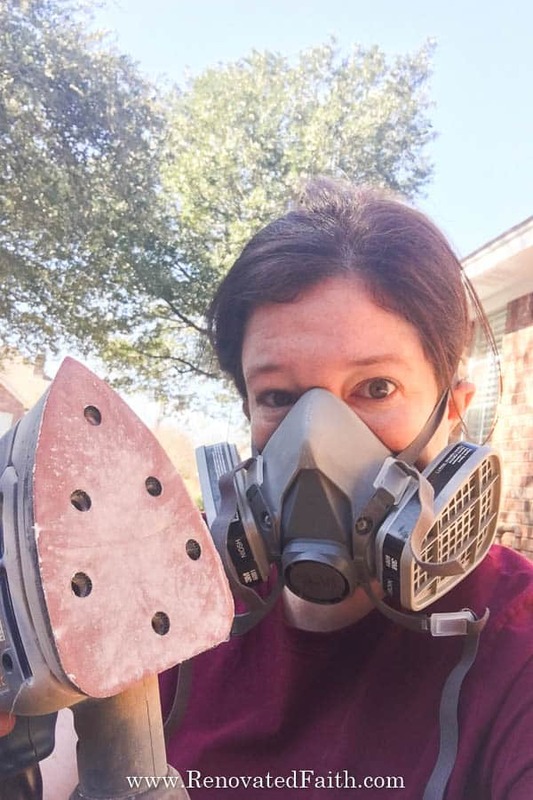 If you are doing some serious sanding and know you will also be around paint fumes, you might want to get a mask like the one that I have on below. For regular sanding, all you really need is one of these. Please excuse the fact that I look slightly psychotic in this picture. 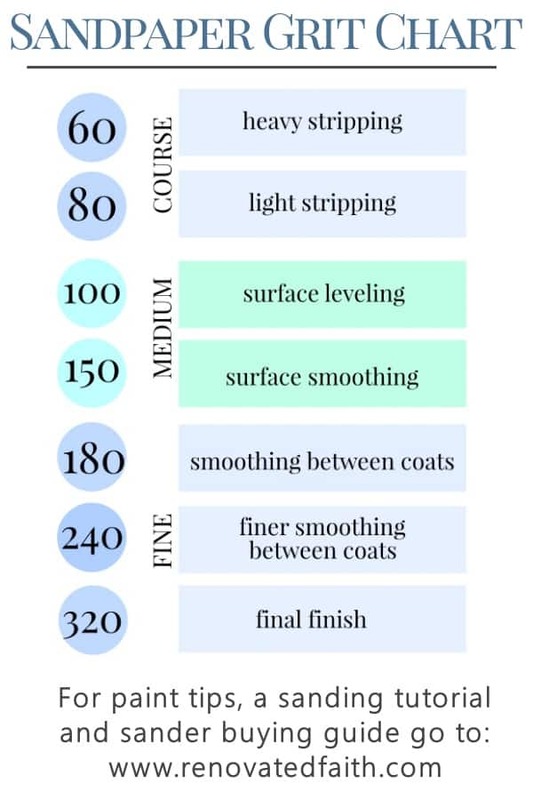 I’ve included this handy wood sandpaper grit chart to help you buy the correct grit or courseness of sandpaper for your project. You can see several sandpaper options HERE. 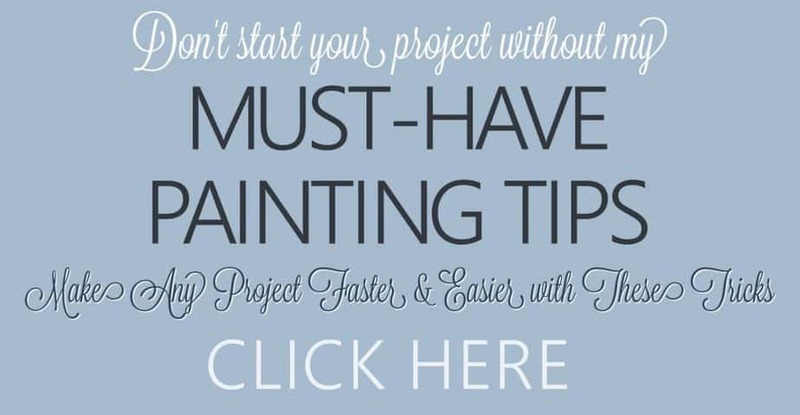 To save tons of time on your next painting project, be sure to download my free Must-Have Furniture Painting Tips to make the process go much smoother. You can also check out my post, A Better Alternative to Chalk Paint where I discuss my best process for painting furniture. Nicely written Karin, the sandpaper grit chart is fantastic too. Thanks for sharing!